The 300 page A4 PDF – which will be Emailed directly to you – gives you the option of reading the book on screen or printing out all or just portions of the book which are of particular interest to the individual reader. 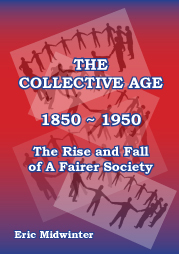 This is an all-embracing historical study of the rise of Collectivism in the United Kingdom. It traces its development from early Victorian times to the late 1940s, using the term to cover both the enormous expansion of state involvement in everyday life alongside the growth of communal values and activity, culminating in the major reforms and civil ethos of the 1940s. The central tranche of eighteen chapters may each be viewed as specialist essays within the whole argument.